The Peach Melba dish was invented in 1892 by the French chef Auguste Escoffier in honor of Australian soprano, Nellie Melba. It combines two favorite summer fruits: peaches and raspberry sauce with vanilla ice cream. The original recipe calls for poaching the peaches in syrup, but this version gives a summer flair to this classic dessert. Preheat grill to medium-high heat. In a small saucepan over medium-high heat, combine ¾ cup sugar, water, 1 tablespoon lemon juice and seeds from vanilla bean. Bring mixture to a boil and cook 1–2 minutes. Remove from heat. Add peaches to syrup mixture, stirring lightly to coat well then set aside. In bowl of a food processor, add raspberries, remaining tablespoon lemon juice and 1 tablespoon sugar then purée until smooth. Pass raspberry mixture through a fine mesh sieve into a small bowl. Cover raspberry sauce and refrigerate, discarding solids. 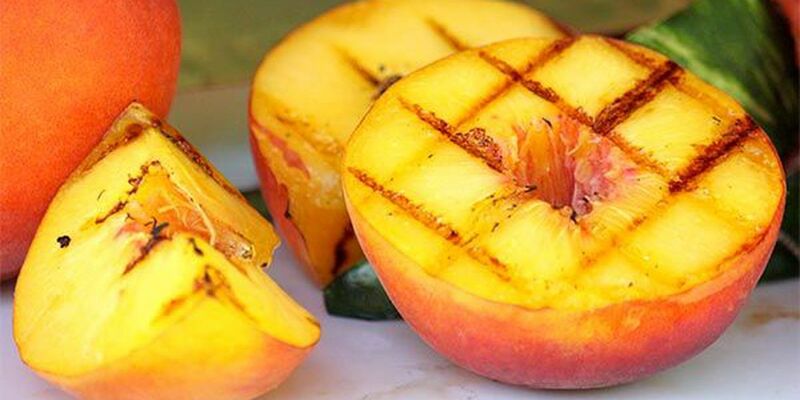 Once the grill is hot, place peaches over direct heat and grill 3–4 minutes on each side or until tender, reserving syrup and transferring to a large bowl. Remove from heat and return to syrup. Cover with aluminum foil and let stand 5 minutes. To serve, place 1 scoop of ice cream into each of 4 bowls and top each scoop with 2 peach halves. Drizzle with raspberry sauce and serve immediately.